Very basically, a water level sensor detects the level of water in a container. Our water level systems use Electronic Sensors for determining the volume of water in a tank. They can replace old systems with mechanical float switches and Capacitive, Conductive or Ultrasonic sensors. 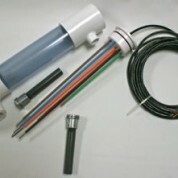 There are lots of water level sensor systems available today. The challenge is in choosing the right system. You need ease of use. You’ll need to easily integrate with your existing systems. You need to monitor and, finally, control it. It is important to select a water control sensor that has an intuitive monitoring system. Ours feature LED indicators and easy to use push button systems. If the sensor can work on autopilot, then you reduce the need for continuous manual monitoring. We say ours system is “so complete you don’t need to be there.” With our controllers and sensors you have a complete level detection and filling system which is fully automatic. Durability is another important factor to consider in a water level sensor. We build systems so they can last for many decades. A modular design will also let you fix individual parts when needed, eliminating the need for a complete replacement. You will never have to replace the entire unit again, simply replace the appropriate part. This kind of design can substantially reduce the cost of maintenance and operation. We have a 100% satisfaction guarantee. If it doesn’t work we will take it back – period. This kind of guarantee shows we are very confident about the effectiveness of our system. Waterline systems utilize a low voltage, which avoids injuries and serious accidents. A low-voltage / low-amp system totally eliminates the possibility of electric shock. During installation and maintenance, you are safe from accidents due to high sensor voltages. Our sensors are listed to UL508 Standard by ETL. The types of sensor you see in today’s market are generally Mechanical, Capacitive, Conductive and Ultrasonic. All of these have many drawbacks, reliability issues, corrosive issues, voltage issues or cost and calibration issues. In an application that contains diesel or certain coolants we do recommend using mechanical float switches. We have developed our own magnetic reed switch that connects directly with our WLC Series controller when needed. Waterline Controls designed and created completely new electronic switch sensor that runs on software. In conjunction with our automatic controllers, with models designed for many markets and application, we offer a complete, simple, and reliable solid state electronic level control system that is also very cost effective. Our water level sensors are built to last, withstanding harsh conditions, compensating for waves, and maintaining an accuracy within 1/8″ of operating range.